Colin Turkington (Volkswagen CC, Team BMR) has won his second BTCC race today at Snetterton ahead of Adam Morgan (Mercedes A-Class, Wix Racing) and Andy Priaulx (BMW 125i M Sport, West Surrey Racing). 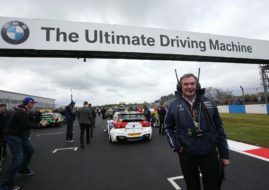 As was the case in the first race, Turkington started from the pole position and remained in the lead till the end. Sam Tordoff‘s BMW had a slow start from the 2nd position and dropped to 4th, behind Adam Morgan and Andy Priaulx. There was one more change in the order in Lap 7 after Jason Plato overtook 4th from Tordoff. Unfortunately, the second race was full of incidents in the opening laps and just 17 drivers succeeded in finish all the 12 laps. Rob Collard was fired off into the barrier on lap one, in an incident that seemed to also involve Stewart Lines’ Toyota Avensis and the Ford Focus of Barry Horne. Gordon Shedden’s weekend went from bad to worse as he was hit from behind by Honda Yuasa team-mate Matt Neal. Neal was then tagged by the Audi of Rob Austin and further contact followed between the triple champion and the Ford Focus of Mat Jackson. There was another racing sandwich that saw Aron Smith’s VW squeezed out of the race and Dave Newsham also spinning out of contention. Tom Ingram was the other party involved and although he was able to continue and enjoy a race-long battle with Andrew Jordan, the Toyota eventually retired with a puncture on the final lap. Jack Goff took sixth spot in the Triple Eight MG and he will start from pole in Race 3. Goff’s team-mate Jordan claimed seventh ahead of Motorbase Performance’s Jackson. Exocet Racing’s Austin was ninth, with AmDTuning.Com’s Mike Bushell claiming his first top ten finish. Four other drivers scored their first championship points of the season with a best ever finish of 11th for James Cole, 13th for debutant Barry Horne, 14th for Robb Holland and a first score for Support our Paras Racing with Derek Palmer claiming 15th. You can check all the fresh results on SnapLap result pages.